NEW BRUNSWICK — Researchers at Rutgers University said they have found another species of tick in Middlesex County that was previously thought to only live as far north in New Jersey as Monmouth County. In an announcement from Rutgers University’s Rutgers Center for Vector Biology in New Brunswick on June 5, it said the Lone star ticks were discovered during the “Tick Blitz” along with confirmation that the exotic east Asian Longhorned tick was found in Mercer County. The Longhorned was previously found in Middlesex, Hunterdon and Union counties. Researchers also now have confirmed that the Longhorned tick has been in New Jersey since 2013. While the Longhorned species has yet to cause any harm to people in the United States, the Lone star tick can cause several problems. Lone star ticks are native to North America, according to the statement. The Tick Blitz “found this aggressive, human-biting tick to be abundant at several sites in Middlesex County,” the statement said. However, because of confidentially agreements, approximate locations where the ticks were found in the county could not be released. The detection of these ticks was made possible through the first-ever statewide Tick Blitz. The effort is led by Rutgers University in New Brunswick in collaboration with the 21 county mosquito control programs. The latest findings of the Longhorned species in Mercer County and the Lone star in Middlesex County also mapped the statewide distribution of the American dog tick. The dog tick is common in the state. Rutgers New Brunswick developed the Tick Blitz in collaboration with the Monmouth County Tick-borne Diseases lab. After an earlier training workshop taught at Rutgers EcoComplex, representatives of each county mosquito control program, aided by Rutgers students and employees of the State Department of Environmental Protection’s Mosquito Control Commission, collected ticks on May 10 at pre-determined locations across each New Jersey county. 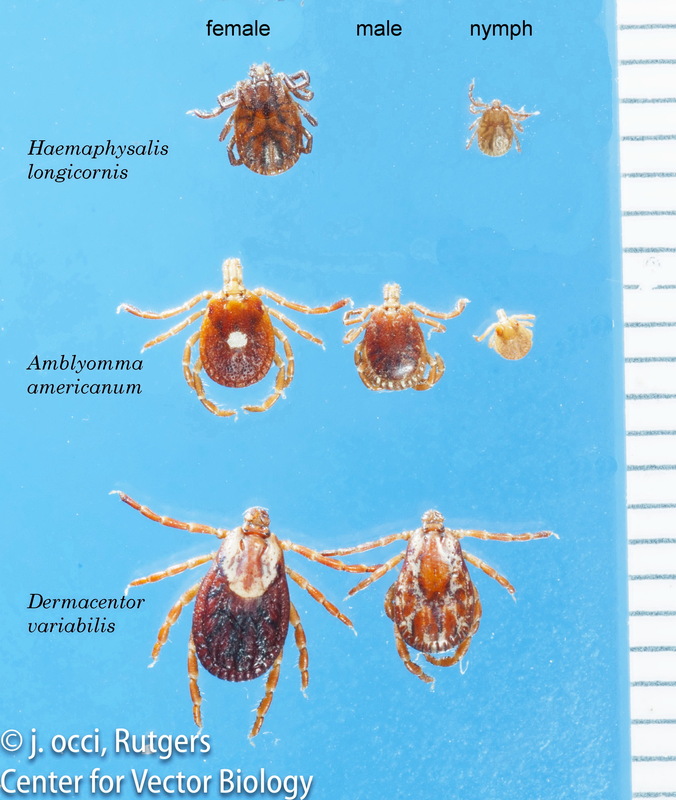 The Rutgers Center for Vector Biology examined all ticks caught statewide, and sent specimens of the exotic Longhorned tick to the U.S. Department of Agriculture’s National Veterinary Services Laboratory (NVSL) for confirmation. Rutgers New Brunswick is further examining ticks of all species found during the Tick Blitz to determine whether they carry microbes capable of causing disease in humans. Earlier this year, the Longhorned tick was confirmed in Hunterdon County, a Union County park and at Rutgers University New Brunswick’s Cook Campus farm in Middlesex County. The tick from 2013 was reexamined by Rutgers University staff and then sent to the NVSL for confirmation, the New Jersey Department of Agriculture said on June 5. Various local, state, and federal animal health agencies, as well as Rutgers, continue to work together to identify the range of the ticks and develop a plan to eliminate them from localized areas and prevent unintentional spread of the tick. Rutgers New Brunswick’s New Jersey Agricultural Experiment Station provides information on tick-borne diseases. Like deer ticks, the nymphs of the Longhorned tick are very small, resembling tiny spiders, and can go unnoticed on animals and people. As part of New Jersey’s investigation, counties have set up drop off locations for the public to submit ticks they find on themselves, their pets, livestock or on wildlife. Information on these locations and how to submit a tick can be found on the New Jersey Department of Agriculture’s website. A tick line has also been established to leave a message if a tick is found and there is uncertainty about what the next steps are. For information about what to do if you find a tick on yourself, pets or livestock call 1-833-NEWTICK (1-833-639-8425).